May 5, 1868 – head of organization of Union veterans, The Grand Army of the Republic, established Decoration day – time to decorate graves of war dead with flowers. 1966, Congress and President Johnson declared Waterloo, NY as the birth place of Memorial Day, because on May 5, 1866, ceremony honored local veterans who fought in Civil war. By the end of the 19th century Memorial Day ceremonies were being held on May 30th throughout the Nation. 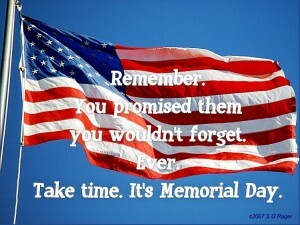 not until after WW I that the day was expanded to honor all who died in all wars. 1971, Congress declared Memorial Day a national holiday.